I’ve never been a fan of New Year’s Resolutions. They just have way too much potential to make me feel like a failure. Last year I wrote a blog in January stating that instead of writing resolutions, I’d set goals. Somehow that seemed better. Everyone says that goals are good for us. I even read a Twitter post recently by psychologist Dr. Henry Cloud that said, “people who set goals are happier than those who don't.” After reading through the list of goals that I wrote down last January, I’m not convinced that his theory is correct. In January 2009 I wrote down 15 different goals; personal, spiritual, and work related. At least a few of them should have been pretty easy to accomplish. In other words, some of them were lame goals. But, how many did I accomplish? THREE! Do I feel happy now? No, as predicted I feel like a failure. I hate feeling like a failure. Dr. Cloud says that in order to reach our goals we need to commit to a process, not a set goal. In other words, if I want to write a book, I don’t put “write book” down as my goal. Instead I set my goal as “spend two days a week writing.” At least I think that’s what he means, but it still sounds like a set goal to me. And, by the way, I did set “process oriented goals” last year. It still didn’t work. Maybe my failure stemmed from not looking at my list of goals at least once a month. I don’t know. I think I need more information to make this work. In light of my 2009 goal setting fiasco, I’ve decided to set only two goals this year. And, I’m happy to share them with you. I might need you to hold me accountable come August. Goal #1: Never refuse free plane tickets. It’s a reasonable goal that shouldn’t be too difficult to accomplish. The exception, of course, would be if someone I’ve never met offers to pay my way to India or something like that. Other than that, I think this is a goal I can easily achieve. Goal #2 will be a little more challenging. I’ve mentioned before in my blog that there seems to be an organized person inside of me screaming to get out. This year, I’m going to give the girl a break and let her have a few days of my life. I’m tired of searching for things. The way I figure it, the old saying “A place for everything and everything in its place,” will be a lot easier to accomplish if there truly is a place for everything. After 34 years of keeping house, I’ve come to the conclusion that my biggest organizational issue is that when I don’t really know where something should go it just sits around on any flat surface I can find as it waits for a home. Flat surfaces are very dangerous! And, I’m armed. I have a label maker and I know how to use it. If you decide to get organized, a label maker really makes the whole process more fun. John will be lucky if I don’t start labeling his underwear! I’ve already made some progress. The Christmas decorations are all labeled in their boxes and yesterday I cleaned out one kitchen cupboard. In said cupboard I found 2 jars of mayonnaise, three boxes of expired tapioca (which sadly I looked for at Christmas and couldn’t find even ONE), countless containers of sprinkles (do they get stale? 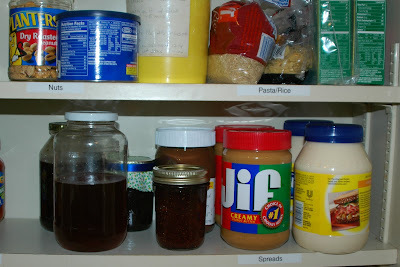 ), eight cans of soup (John feels more secure with soup in the cupboard), and a number of other items that were way past prime. I just know that you are dying to see my newly arranged cupboard. Sorry, I didn’t take before shots. It was one of those spur of the moment decisions and cans were already strewn about the kitchen before I even thought of a photo. Trust me, it was BAD! So, we’ll see how the year goes. If I can see the top of my desk by the end of February, I’ll be thrilled. Baby steps . . . I remember you always had mayo on hand. That's a lot of tapioca. Have fun labeling. 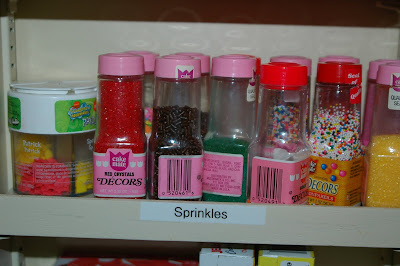 I absolutely LOVE that you have a section labeled "Sprinkles"!! :) How fun is that? Now I know who to turn to when I've run out and need some in a pinch! Your sprinkle inventory is absolutely crazy, Miss Nancy. WHO has that many sprinkles in their pantry? I guess we now know the answer to that one. In 2000 I felt God's call to minister to women. It has been, and continues to be, my privilege to serve Him in women's ministry.